I bought this one on a whim as my free book from my monthly Audible subscription and am so happy I was impulsive with my credit! This book was phenomenal. Greta Helsing is a doctor to the supernatural. If you are a vampire, werewolf, ghoul, demon, or the like in the London area, you go to Dr. Helsing for care. When a serial killer begins picking off humans and supernatural alike, Greta is sucked into the mystery, being the one who is called upon to patch up an attack on the friend of a friend (who is coincidentally a vampire). A secret sect is terrorizing London, and they don't appreciate Greta's meddling with their attempted slayings. Can Greta and her band of misfits get to the bottom of the murders before the killers silence them for good? Granted, I am a fan of all things supernatural but this was a fantastic read. Everything from the deary setting of London to the eccentric and likable characters ( I don't think I have ever wanted to hold and cuddle a ghoulette more in my life) was enough to draw me in and get me hooked. In addition to the action packed plot line, the authors writing style was captivating, almost lyrical. 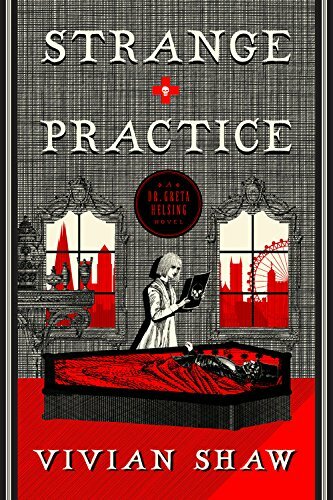 Although the story could be a stand alone novel, I was excited to learn that this is one in a projected series, following Greta and her unique medical practice across various other mysteries and unfortunate supernatural events within London. If you are a fan of the supernatural, and a good 'ol fashioned mystery, I cannot recommend this one enough!